I have recently focused on using the Handibot 2.0 to create a series of woodcut blocks to “print on demand” at the upcoming technology faire. 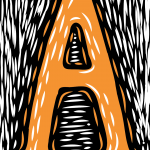 I decided to create an alphabet set, or font, that could be used to embellish a series of associated woodblock images that visitors can print, while I proceed to output some more printing plates on my Handibot 2.0. 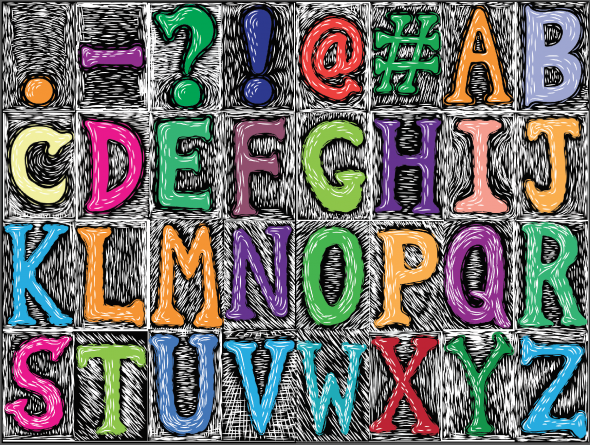 Creating an Alphabet is also a great way to practice design of multicolor “process printing” which uses a series of aligned blocks to create color overprints, similar to the traditional 4-color printing process (Cyan, Magenta, Yellow, and Black). I am using a Wacom Tablet to retain the hand-drawn style, complete with imperfections and minimal ‘undo’ with respect to the traditional woodcut medium. Of course, I am not restricting my designs to CMYK or even RGB. Some prints are monotone, some look best in duotone, some tritones use a 3rd plate to create accent colors, and some very ambitious images will use full four color separations, or posterization. Each letter has invoked a side project, of which there are many! All of the ideas are from my personal sketchbooks. Some concepts have been “in progress” for a week, a month, a year, or more! Some items have been on the front burner, and this is a “kickstart” to breathe new life into the builds that begin to emerge from the drawn pages into real life. The beta test of the interactive art installation for this new series will be shared at the Maker Faire which is my favorite audience to share with, and learn from. Usually, when I create a really innovative concept sketch for a new product, feature, contraption, invention, or artistic endeavor, I will mysteriously see it on Kickstarter, Facebook, Twitter, Instagram, Pinterest, Flickr, or even the nightly news, within a day or so. This is part of the excitement of being a Maker. Or just enjoy them for what they are today; Visual expressions of design and technology that I am inspired to create every day. In the spirit of continual improvement, nothing is ever truly finished, only created and sometimes destroyed.